For details about more recent publications, click here. Publication date not yet confirmed. 1stBooks Library, Bloomington, Indiana, USA. 2002. - transcriptions (with commentary) of all of the references to music and theatre from the Malmesbury archive. Oxford University Press. February 2002. Harvard University Press. December 2001. Oxford Monograhs on Music. Oxford Universtiy Press. May 2001. The Kent State University Museum, Kent, Ohio. 1998. Peter Lang Publishing, Inc. 1997. Published by the Hampshire County Council. December 1995. Cambridge University Press. 1995 (cloth); 2005 (softcover). Handel and His Singers : The Creation of the Royal Academy Operas, 1720-1728. From "The Master Musicians" series (#3). From "The Illustrated Lives of the Great Composers" series. The British Library, London, 1993. William B. Eerdmans Publishing Co. 1993.
by William Weber (Professor of History, California State University, Long Beach). Harcourt Brace & Company. 1992. Edited by Stanley Sadie and Anthony Hicks. University of Rochester Press. 1991.
by Winton Dean and John Merrill Knapp. William Andrews Clark Memorial Library. 1987. The Edwin Mellen Press Ltd. 1986. Handel: A Celebration of his Life and Times. Edited by Jacob Simon. National Portrait Gallery, London, 1985. The September Press (Wellingborough). 1985. Printed by Creasey Flood Limited (Suffolk). 1985. Little, Brown and Company. 1984. St. Martin's Press, New York. 1982.
by Winton Dean with Anthony Hicks. New Grove Dictionary of Music and Musicians. 1980. W.W. Norton and Company. 1982. Clive Bingley Ltd. (London) 1972. The Manchester Public Libraries. 1972. Cassell & Company, Ltd., London. 1969. University of California Press. 1969. Meredith Press (New York) 1968. Thomas Y. Crowell Co. (New York) 1968. Adam & Charles Black. 1965. From the "Masters of Music" series. David White Publishers, New York. 1965. Novello & Co. Ltd 1963. Calderbook. John Calder, Ltd. (London) 1962. Cassell and Co. Ltd. 1948. * Gustavus Waltz: Was He Handel's Cook? Max Parrish & Co., Ltd. 1948. The Manson Park Press. 1947. Edited by Sir Jack Westrup. From "The Master Musicians" series (#2). J.M. Dent & Sons Ltd. 1947. - 1959: Alfred A. Knopf. 2nd edition. (revised) - "Handel Bicentenary Edition"
The Harrow Replicas, No. 8 in a series. Commentary by Otto Eric Deutsch and Henry Havergal. Publisher: W. Heffer & Sons, Ltd. (Cambridge) 1945. The Letters and Writings of George Frideric Handel. Edited by Erich H. Mühler. Books for Libraries Press. 1935. Henry Holt & Co. 1916. From the "Masterpieces of Music" series. TC & EC Jack (London); FA Stokes Co. (New York). 1913. Sherratt & Hughes, London. 1908. J.J. Keliher & Co. Ltd. (London). 1904. From "Bell's Miniature Series of Musicians"
G. Bell & Sons (London). 1904. From "The Master Musicians" series (#1). J.M. Dent & Sons Ltd. 1901. Seeley & Co., London. 1896. Cassell & Co., Ltd. 1885.
from the "Reeves Music Primers - Biographical Series - No. 2"
William Reeves, 185, Fleet Street, Publisher (London). 1882. Musical Memoirs Comprising an Account of the General State of Music in England from the First Commemoration of Handel in 1784. Henry Colburn & Richard Bent London. 1830. 333 pp. Europäische Verlagsanstalt / Rotbuch Verlag, Hamburg. 2001. Händel Oratorien, Oden und Serenaten. Vandenhoeck und Ruprecht, Göttingen. 1998. Siehe, dein König kommt. Leben und Musik des Georg Friedrich Händel. Eine Biographie. Georg Friedrich Händel. Eine Biographie. VEB Deutscher Verlag für Musik. 1984. Published by the Hallische Händel-Ausgabe. Volume 2: Oratorios, Cantatas, Sacred works, etc. Georg Friedrich Händel. Sein Leben in Bildern. VEB Deutscher Verlag für Musik. 1963. Georg Friedrich Händel. In Selbstzeugnissen und Bilddokumenten. Georg Friedrich Händel. Ein biographischer Roman des Barock. Berlin: Imberg und Lefson. 1898. Berlin u. Leipzig J. Guttentag. 1882. Méridiens-Klincksieck (Les Musiciens du monde). 1991. Händel e gli Scarlatti a Roma. Antonius Bittmann: "Handel's organ concertos: Studying aspects of ornamentation and improvisation with eighteenth-century performers." Vol. 20; 2002; pp. 45-90. 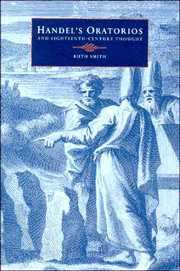 Ruth Smith: "Early music's dramatic significance in Handel's Saul", Vol. 35, No. 2, May 2007. pp. 173-190. Graham Pont: "French overtures at the keyboard: the Handel tradition", Vol. 35, No. 2, May 2007. pp. 271-288. Andrew V. Jones: "Staging a Handel Opera" Vol. 34, No. 2, May 2006. pp. 277-288. Gregory Barnett: "Handel's borrowings and the disputed Gloria". Vol. 34 No. 1, February 2006. pp. 75-92. Graham Cummings: "Handel and the confus'd shepherdess: a case study of stylistic eclecticism". Vol. 33 No. 4, November 2005. pp. 575-90. H. Diack Johnstone. "Handel at Oxford in 1733." Vol. 31 No 2, May 2003. pp. 248-61. Clifford Bartlett; Anthony Hicks; Hans Joachim Marx; and Michael Talbot: "The 'Handel' Gloria reconsidered" Vol. 30, No 2, May 2002. pp. 252-62. H. Diack Johnstone. "A flourish for Handel." Vol 29, No 4, November 2001. pp. 619-25. Xavier Cervantes and Thomas McGeary. "Handel, Porpora and the 'Windy Bumm'." Vol 29, No 4, November 2001. pp. 607-16. Hans Joachim Marx. "A newly discovered Gloria by Handel" in Early Music. August 2001. pp. 343-52. David Hunter: "Patronizing Handel, Inventing Audiences. The Intersections of Class, Money, Music and History." Vol 28, No 1. February 2000. pp. 32-49. Judith Milhous and Robert D. Hume. "Heidegger and the Management of the Haymarket, 1713-7." Vol 27, No 1. February 1999. pp. 65-84. Donald Burrows and Robert D. Hume. "George I, the Haymarket Opera Company and Handel's Water Music." Vol 19. August 1991. pp. 323-41. Donald Burrows. "Handel, the Dead March, and a Newly Identified Trombone Movement." Vol 18, No 3. August 1990, pp. 408-16. John Arther Rice. "An Early Handel Revival in Florence." Vol 18, No 1. February 1990, pp. 63-71. David Hunter: "Miraculous Recovery? Handel's Illnesses, the Narrative Tradition of Heroic Strength and the Oratorio Turn," Volume 3, Number 2, September 2006, pp. 253-267. Ruth Smith: "Comprehending Theodora", Volume 2 Number 1, March 2005, pp. 57-90. Hans-Joachim Kreutzer (München): ‘The Sublime, the Grand, and the Tender’: Über Händels Messiah und Klopstocks Messias. Hans-Joachim Meyer (Berlin): Macht Händel uns zu Europäern? Die europäische Gegenwart und das kulturelle Gedächtnis Europas. Hans Joachim Marx/Steffen Voss (Hamburg): Die Händel zugeschriebenen Kompositionen I (Arien und Lieder, HWV Anh. B 001–032). Steffen Voss (Hamburg): ‘Dieses musikalische Bund Stroh’: Ein unbekanntes Oratorium von Georg Philipp Telemann im Urteil Carl von Winterfelds und Friedrich Chrysanders. Hansjörg Drauschke (Leipzig): Die Oper als ‘musikalische Universität’: Johann Mattheson als Schüler und Lehrer am Hamburger Gänsemarkt. David Hunter (Austin, Texas, USA): The Irish State Music 1716–1742 and Handel’s band in Dublin. Angela Baier (München): ‘Jehova hath redeemed Jacob’ – Belshazzar als jakobitisches Oppositionsdrama. Tassilo Erhardt (Middelburg, NL): Messiah im Kontext der theologischen Bibliothek von Charles Jennens. Reginald Sanders (Gambier, Ohio, USA): The Israelites in Hamburg and London: Carl Philipp Emanuel Bachs Die Israeliten in der Wüste and Handels ‘Israelite Oratorios’. Thomas Synofzik (Zwickau): ‘Nach dem Originalmanuskript’? Felix Mendelssohns Düsseldorfer Aufführungen von Händels Israel in Egypt. Wolfgang Sandberger (Lübeck): Zum Motiv und zur Dramaturgie des Herkules auf dem Scheidewege bei Bach (BWV 213) und Händel (HWV 69). Colin Timms: What did Handel learn from Steffani's operas? Donald Burrows: "Something necessary to the connection: Charles Jennens, James Hunter, and Handel’s Samson." Spring 2004. Anthony Hicks. "Acis and Galatea in 1736." Spring 2004. Ellen T Harris: "Handel's Accumulation of Wealth" Vol.13 No.1, Spring 2002. Thomas McGeary: "New Accounts of Handel and the Oxford Act." Vol.13 No.1, Spring 2002. David Hunter: "Messiah in Cork in 1744" Vol.12 No.1, Spring 2001. Howard Serwer. "Handel and the Coordination of National Styles: Bukofzer Revisited." Vol.12 No.1, Spring 2001. Includes a bibliography of new literature and CDs about Handel issued during 2004, and some corrections to last year’s article by Ursula Kirkendale. Note: Corigenda published in volume 51, 2005. Volume 49, 2003: Edited by Dr. Konstanze Musketa. Eva Zöllner: 'He hears no other music if he can help it'. George III. und die Händel-begeisterung am englischen Hof in der zweiten Hälfte des 18. Jahrhunderts. John H. Roberts. "The Story of Handel's Imeneo"
Karin Zauft. "An article on the Handel Opera Renaissance in Halle, 1945-1952." Manfred Rätzer. Appendix to "Szenische Aufführungen..." of complete Handel stagings during the year 2000. ...And the publication of various papers given at the 2000 Halle Handel Conference "Music and Musical Life in Middle Germany Before and After Handel's Time". Wendy Heller: “The Beloved’s Image: Handel’s Admeto and the Statue of Alcestis,” Journal of the American Musicological Society. 58/3 (2005 Dec): 559-637. David Charlton and Sarah Hibberd: "‘My father was a poor Parisian musician’: A Memoir (1756) concerning Rameau, Handel's Library and Sallé" Volume 128, Issue 2, 2003. pp.161-199. Donald Burrows: "'Mr Harris's Score': A New Look at the 'Mathews' Manuscript of Handel's 'Messiah'" Volume 86, Number 4: November 2005. pp. 560-72. Ellen T Harris: "Handel the Investor". Vol. 85, Issue 4, 2004. pp. 521-75. Suzanne Aspden. "Desiring Handel: Biography and the Strategies of Possession." Vol. 85, Issue 1, February 2004. pp. 62-82. Mary Ann Parker: "Handel's Il trionfo del Tempo e del Disinganno: A Petrarchan Vision in Baroque Style." Vol. 84 Issue 3, 2003. pp. 403-13. Hans Joachim Marx, Steffen Voss: ""Die Georg Friedrich Händel zugeschriebenen Kompositionen in den thematischen Katalogen von Breitkopf (1762-1768)" [The compositions attributed to Handel in the thematic catalogue by Breitkopf (1762-1768)] in: Im Dienst der Quellen zur Musik. Festschrift Getraut Haberkamp zum 65. Geburtstag, ed. by Bischöfliche Zentralbibliothek Regensburg durch Paul Mai, Tutzing: Hans Schneider, 2002, S.351-361. Derek K Alsop. "Artful Anthology: The Use of Literary Sources for Handel's Jephtha." Vol. 86, Issue 2, Summer 2002. pp. 349-362. PM Potter. "The Twentieth Century and Beyond. The Politicization of Handel and His Oratorios in the Weimar Republic, the Third Reich, and the Early Years of the German Democratic Republic." Volume 85, Issue 2. Summer 2001. pp. 311-341. Donald Burrows: "Perhaps Handel was right after all: some thoughts on editing Ariodante." 148/1898 (Spring 2007). Ilias Chrissochoidis. "A Handel Relative in Britain? (also Cutting through the 1759 Fence in Handel Studies)," 148/1898 (Spring 2007): 49-58. Donald Burrows. "The word-books for Handel’s performances of Samson." Spring 2005. Peter Holman. "The origins of the Handelian organ concerto." Summer 2003. Rachel Cowgill. "The Halifax Judas: an Unknown Handel Arrangement by Mozart?" Spring 2002. Proceedings from the International Händel-Akademie Karlsruhe 1998 and 2000: Ausdrucksformen der Musik des Barock: Passionsoratorium - Serenata - Rezitativ. Edited by Siegfried Schmalzriedt, published by Laaber Verlag, 2002. Most articles in German. Several articles in German, by authors such as Hans Joachim Marx, Reinhold Kubik, etc. Ilias Chrissochoidis. "A Chubby Orpheus: Handel's Corpulence as a Prerogative of Genius," in Consuming Culture in the Long Nineteenth Century: Narratives of Consumption, 1700-1900, ed. Tamara S. Wagner and Narin Hassan, 193-204. Lanham, MD: Lexington Books, 2007. AK Adams, B Hofestadt. Georg Handel (1622-97): the barber-surgeon father of George Frideric Handel (1685-1759). J Med Biogr. 2005 Aug;13(3):142-9. Deborah Rooke: "On the 'Handel-ing' of 1 Maccabees: Thomas Morell's use of biblical sources in the libretto of Judas Maccabaeus," Scottish Journal of Theology. Volume 57, Issue 2, May 2004, pp 125-138. Bazner H, Hennerici M. Georg Friedrich Handel's strokes. Cerebrovasc Dis. 2004;17(4):326-31. David Hunter: "Puppet Politics: Tobias Smollett, Charlotte Charke, and Theatrical Opposition to Handel" in Theatre Notebook. 58 (2004): 7-17. Huub van der Linden: "Benedetto Pamphilj as librettist: Mary Magdalene and the harmony of the spheres in Handel’s Il Trionfo del Tempo e del Disinganno" in Recercare, xvi (2004), pp. 133-161. Hans Joachim Marx / Steffen Voss. "Unbekannte Kantaten von Händel, A. Scarlatti, Fago und Grillo in einer neapolitanischen Handschrift von 1710" [concerning the manuscript SA 1380 of the 'Singakademie zu Berlin', today as Depositum in: Berlin, Staatsbibliothek], in: Bianca Maria Antonlini / Teresa M. Gialdroni / Annunziato Pugliese,(Ed. ), "Et facciam dolci canti". Studi in onore di Agostino Ziino in occasione del suo 65o compeanno, vol .I, Lucca 2003, p. 797-806. Pierre Degott. "'With Words so Sounding and so Rich in Sense' : La traduction de Rinaldo (1711) par Aaron Hill. ", La Traduction des genres non romanesques au XVIIIe siècle. Colloque international 14-15 mars 2003, ed. Annie Cointre and Annie Rivara (Metz : Publications de l’Université de Metz, 2003) 329-43. Donald Burrows. 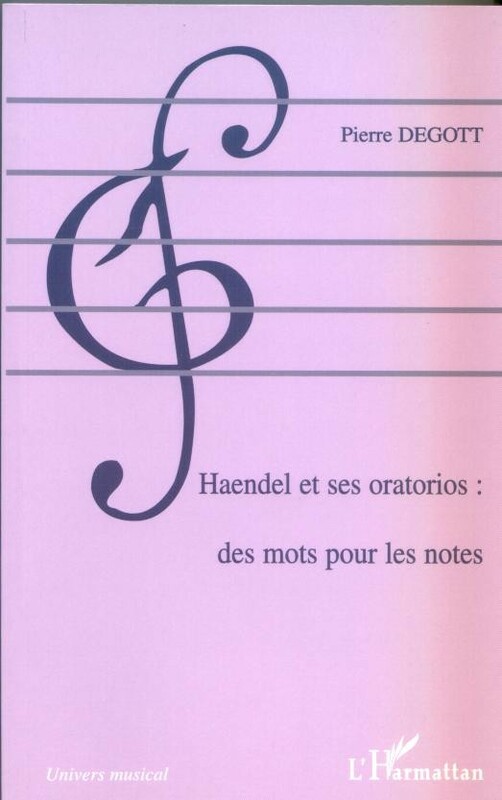 "'Reading the Metre': Verse Forms in Oratorio Librettos written for Handel by Charles Jennens and Thomas Morell' in Andrée-Marie Hermat (ed. ), in Musique et Litératures: Intertextualités (Anglophonia xi), Presses Universitaires de Mirail, 2002. Donald Burrows. "Handel in London" in Europäische Musikgeschichte, Vol. 1; pp. 461-498 (Chapter 12); Barenreiter, Kassel, 2002. David Hunter: "George Frideric Handel and the Jews: Fact, Fiction, and the Tolerances of Scholarship," in For the Love of Music: Festschrift in Honor of Theodore Front on His 90th Birthday, ed. Darwin F. Scott. Antiqua musica, 2 (Lucca: Lim antiqua, 2002), 5-28. David Hunter: "Inviting Handel to Ireland: Laurence Whyte and the Challenge of Poetic Evidence," Eighteenth-Century Ireland 20 (2005): 156-168. NOTE: Rätzer's handbook is a fully indexed chronology of staged Handel performances, including operas, oratorios, odes, cantatas, serenades and pasticci. It extends from Handel's own performances of Almira in 1705 until the Venice Baroque Orchestra's production of Siroe in December 2000. The title and foreword are in German, but a working knowledge of that language is not essential for gleaning reams of fascinating information from this book. 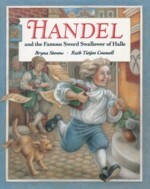 Due to the proliferation of Handel around the world these days, such a project will never be finished, so Rätzer published a completed list of Handel staged performances during the year 2000 in the 2001 volume of the Händel-Jahrbuch. Donald L. Blanchard: "George Handel and his Blindness." in Documenta Ophthalmologica 99 (1999): 247-258. Evers S. Georg Friedrich Handel's strokes. J Hist Neurosci. 1996 Dec;5(3):274-81. 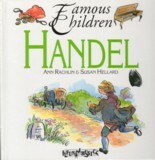 Handel: Who Knew What He Liked is a witty and cleverly written book for children aged 8-12, but can also be enjoyed by older Handelians. 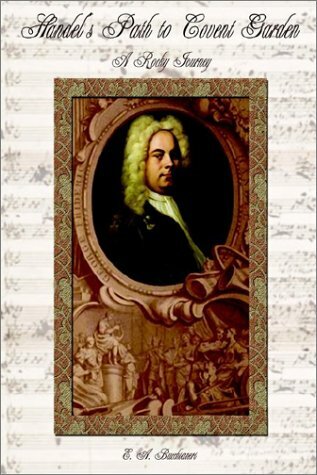 It is an excellent biographical introduction of Handel: M.T. Anderson has successfully compressed a complicated life and a varied career to a few judicious words, and the book is affectionately illustrated by Kevin Hakwes. Some small details are presented as fact that are suspiciously mythical or novel, and there are a couple of odd chronological leaps, yet they do not detract from the purpose of the book, which is to convey Handel's development from a child prodigy into the composer of Messiah. It is pleasing to note that the authors have benefited from the advice of Professor Ellen T. Harris, and include a sensible bibliography and reliable discography - possibly intended for those parents whose curiosity might be aroused. E.P. Dutton & Co. Inc. (New York). 1943.